We occasionally get inquiries about a newer Revere pressure cooker, made and sold during the 1990’s (as best we can tell). Because there is no model number on the unit, and really no other info that might identify it properly, it is extremely hard to find any info about this pressure cooker on the internet. We managed to find one of these new-in-box with the manual, so have gathered a bit of information on them. This style seems to have come in 3 and 6 quart varieties that differed only in height. Please visit our information page on that pressure cooker for all the information we have on that model, including the manual. 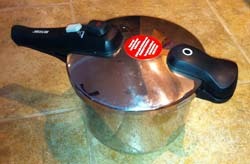 My mother and I bought a Revere 3 quart Pressure Cooker in the late 1990’s. As near as I can tell, the characters ” 18/10 ” are embossed on it’s bottom. Could these characters possibly be the product’s model number? If so, is there any way to get manuals, service, and support for this product. It is still in working condition, and I would hate to throw it away. Are you sure it isn’t one of these? They do say 18/10 on the bottom. That particular number is the specification for the type of stainless steel (18% chromium/10% nickel) not a model number. Unfortunately Revere rarely if ever put model numbers on the bottom, or anywhere on cookware. Hi, I have both of the pressure cookers listed above. I did order the gasket from Amazon that your site said fit. Part #09906. I received it today, however it is much stiffer that the original gasket. In fact I cannot get the pressure cooker to close at all. I was wondering if you had any tips to get this to work. These pressure cookers are in very good condition and I don’t want to have to buy another one. Is this the only gasket that you know of that fits? No idea why it doesn’t work. In our tests it fit perfectly and the pressure cooker was able to close. I cannot even force it shut. The gasket is thicker and it will not let the lid drop down in the grove enough to close. It is hitting metal against metal. I ordered the 09906 gasket as per your sites suggestion. I am just wondering if Presto changed something. I still have one of the original gaskets, but it is the only one that I have. Since I have both of these pressure cookers, I was hoping to find a gasket that fits properly so I can use both at the same time. I am having the same issue–cannot get it to close–a big fight to do it. Then, during the cooking process, there is a loud CRACK–sounds as if it is going to explode. The pot & the lid are in perfect shape. The “replacement” gasket does not fit correctly. The link provided in this sentence above, “Please visit our information page on that pressure cooker for all the information we have on that model, including the manual”, brings you right back to this page. The link has been fixed, thanks for letting us know. Unfortunately we don’t have a line on the weights. The place most likely to have something like that is pressurecooker.com.au, so I would try there. Following the advice on this site, I found a couple suppliers of Chef’s Design pressure cooker parts and it appears they were the maker of these Revere Ware pressure cookers. Each of the websites had the weights available. I personally own the 6qt stainless Revere model and all the parts look just like mine. 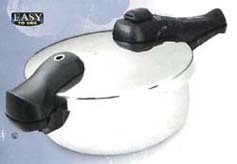 Just Google Chef’s Design pressure cooker parts and you’ll find the suppliers. If you found some links to parts other than what we already have listed on our information page, please post them here.